Carbon monoxide is a colorless and odorless gas that can be fatal when inhaled. It’s also known as the silent killer because it leaves no trace of itself when pouring into your house. Over 150 Americans die every year from carbon monoxide poisoning. It is the bi-product of any fuel-burning appliances, such as gas, propane, oil, wood, and coal. If you have fire, you have carbon monoxide. CO detectors are encouraged to be placed on every level of your home and placed about 15 feet from fuel-burning appliances. If you have an attached garage, it is recommended to place one in there as well. 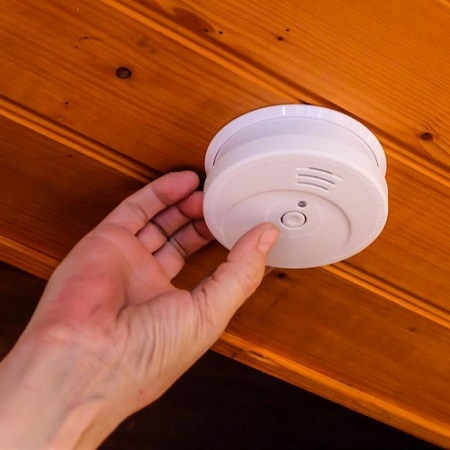 Only one-third of American households have carbon monoxide detectors. It is required in some states, but not in all. A CO detector is important because it detects carbon monoxide levels in your area. By installing a detector into your home, you will be able to protect your loved ones and yourself from the fatal poison. When the detector senses CO, it signals an alarm, which is an indication to grab your family and pets and get outside immediately. Call 911 if the alarm sounds after you get everyone out of the house. The fire department will be able to apprehend the situation. Properly equipping your home with a carbon monoxide alarm is the only way you will know if you have a leak. Make sure nothing is obstructing or covering the unit. Avoid placing it next to doors or windows. Also, be sure to test the detector once a week by pressing the test/reset button. It is important to follow the manufacturer’s instructions when it comes to installing and operating your device. Be sure to purchase appliances that have been approved by a nationally recognized testing laboratory. A typical life of a CO detector is 5-7 years. Be sure to replace when necessary. Never burn fuel inside the house, such as a BBQ or propane heater. Choose appliances that are able to vent their fumes outside when possible. Although it seems like common sense, don’t use stoves, dryers, or ranges to heat your home. Have a professional check your appliances and chimney every year to make sure everything is in good working condition and there are no blockages. Carbon monoxide poisoning tends to happen more in winter. Because of this, be sure that vents from the stove, fireplace, dryer, and furnace have no debris or snow blocking the way of the fumes exiting the house. While the thought of carbon monoxide entering your home can be scary, you have the ability to protect your loved ones. Be sure to shop at Brinkmann’s Hardware for your new carbon monoxide detector.